The select colors used to create the chess pieces and board in this premium alabaster set shimmer against the light producing a dazzling appeaarance. The lively combination of soft white and royal blue tones cover the board and the opposing armies. 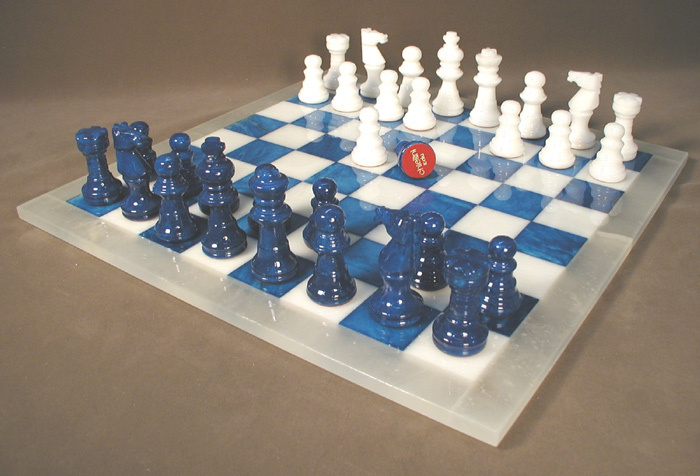 The Chessboard has an underside protective lining so your furnishings won’t suffer blemishes. A magnificent treasure any chess player will admire! The set measures 14.5" x 14.5" x 0.50". The king measures 3" with a 1.13" base.